Oshawott has a light blue body and a white head. It has a brown fuzzy nose, medium blue ears and black embroidered eyes, mouth and freckles. It’s arms are white, it’s feet are medium blue and it has a cream shell on it’s stomach. 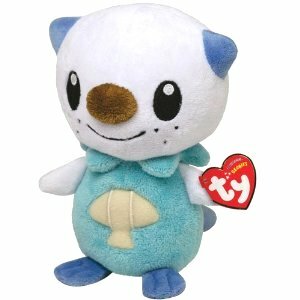 Oshawott was introduced along with five other Pokemon Beanie Babies in October 2011, the others being Pikachu, Snivy, Tepig, Pansage and Axew.